The poem of 'Erlkönig'—adapted from a Danish folk ballad—comes from a little-known Goethe play with music, Die Fischerin, performed at the Weimar court in 1782. The fisher-girl of the title, Dortchen, sings it softly to herself one evening as she mends her nets. What Goethe expected (and, in Weimar, got) was a simple quasi-folk tune repeated for each verse. 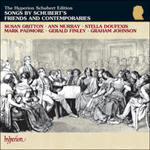 Schubert in 1815 recreated the poem in music of searing dramatic power. 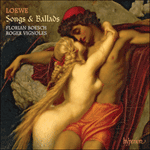 Loewe’s song, composed two years later, is less violently ‘interventionist’ than Schubert’s, more faithful to the externals of the narrative—doubtless part of its appeal to Goethe—but hardly less powerful. Wagner, for one, far preferred the Loewe setting. Where Schubert immediately establishes an atmosphere of panic with the feverishly pounding hooves, Loewe initially depicts the eerily rustling leaves, with the galloping motion merely implied. Only after the father’s first, comforting words to the sick boy does the galloping rhythm become explicit. The hypnotically repeated nursery tune for the Erlking’s words acquires a seductive-sinister twist from the flicking grace notes; and while Loewe’s song is generally more restrained than Schubert’s, his ending, conversely, is more melodramatic, with pregnant silences and a ‘shock’ diminished seventh chord on ‘tot’. Le poème d’Erlkönig—adapté d’une ballade traditionnelle danoise—vient d’une pièce en musique peu connue de Goethe, Die Fischerin, jouée à la cour de Weimar en 1782. La pêcheuse du titre, Dortchen, se la chante doucement un soir en réparant ses filets. Ce que Goethe attendait (et, à Weimar, il l’a obtenu), c’était un air simple quasi traditionnel repris pour chaque vers. En 1815, Schubert a recréé le poème en une musique d’une puissance dramatique fulgurante. L’œuvre de Loewe, composée deux ans plus tard, est moins violemment «interventionniste» que celle de Schubert, plus fidèle aux apparences du récit—c’est sans doute en partie ce qui a plu à Goethe—mais à peine moins puissante. Wagner, quant à lui, préférait de loin la version de Loewe. Là où Schubert crée immédiatement une atmosphère de panique avec le martellement fébrile des sabots, Loewe commence par dépeindre le bruissement inquiétant des feuilles, le mouvement de galop étant simplement implicite. C’est seulement après les premières paroles réconfortantes du père au garçon malade que le rythme du galop devient explicite. L’air de la chanson enfantine repris de manière envoûtante pour les paroles du Roi des aulnes prend un tour séduisant et sinistre avec les petites notes qui font un bruit sec; et si la ballade de Loewe est dans l’ensemble plus sobre que le lied de Schubert, sa conclusion est à l’inverse plus mélodramatique avec ses silences lourds de sens et une septième diminuée «choc» sur «tot». Das Gedicht über den Erlkönig—eine Bearbeitung einer dänischen Volksballade—stammt aus einem kaum bekannten Singspiel Goethes, Die Fischerin, das 1782 am Weimarer Hof aufgeführt wurde. Darin singt das Fischermädchen Dortchen die Ballade leise vor sich hin, als sie eines Abends ihre Netze flickt. Goethe erwartete eine schlichte, volksmusikartige Melodie, die Strophe für Strophe wiederholt würde (so geschah es in Weimar auch). Schuberts musikalische Nachempfindung des Gedichts von 1815 war von schneidender dramatischer Kraft. Loewes Lied entstand zwei Jahre später und ist weniger leidenschaftlich und weniger „interventionistisch“ gehalten und mehr dem Text angepasst als Schuberts Vertonung—was sicherlich einer der Gründe dafür war, warum Goethe es schätzte—jedoch ist es kaum weniger wirkungsvoll. Wo Schubert sofort mit den fieberhaft galoppierenden Hufen eine panikartige Atmosphäre erzeugt, stellt Loewe zunächst das schaurig raschelnde Laub dar, wobei das Galoppieren lediglich angedeutet wird. Erst nach den ersten tröstlichen Worten des Vaters an seinen kranken Sohn wird der galoppierende Rhythmus explizit dargestellt. Das hypnotisch wiederholte Kinderlied für die Worte des Erlkönigs nimmt durch die schnippenden Vorhalte eine verführerisch-sinistere Färbung an, und während Loewes Lied im Großen und Ganzen zurückhaltender ist als Schuberts, ist sein Schluss jedoch, mit bedeutungsvollen Pausen und einem „schockierenden“ verminderten Septakkord bei „tot“, melodramatischer gehalten. „Komm liebes Kind, komm, geh mit mir! 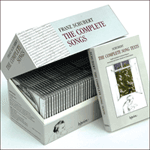 There is something here of the same white-heat of inspiration as we hear in Schubert’s song, although we are more aware of Schubert’s preparatory work towards a position of mastery than we are of Loewe’s. As in the Schubert song, it is the composer’s command of piano-writing that sets the scene with an infallible sense of unease; the strength of the octaves in the left hand provides exactly the right tension and menace. The appearance of the Erl King, a figure whose sweetly repetitive major-key triads make him appear all the more dangerous, is a real coup de théâtre. The intensification of the piano-writing towards the end (at ‘Mein Vater, mein Vater, jetzt fasst er mich an!’) is remarkably inventive; we are aware of the horse galloping faster, but there is no need here for Schubert’s accelerando.